A global, member-driven organization mobilizing life sciences and healthcare professionals. DIA's members come together to collaborate and problem-solve, discussing global and local challenges facing the life sciences field in an increasingly more complex and interconnected world. DIA's goal, and our members' hope, is for this collaboration to result in better policies, regulations, science, research and development, and ultimately better patient outcomes worldwide. Offering a multidisciplinary neutral environment, respected globally for integrity and relevancy. DIA is your essential partner in catalyzing knowledge creation and sharing to accelerate healthcare product development. Starting with the controversy over the drug Thalidomide, DIA’s founders - a group of 30 pharmaceutical professionals, medical writers, and academics - came together to create a platform for necessary global communication and collaboration to solve a healthcare threat to unborn children worldwide. 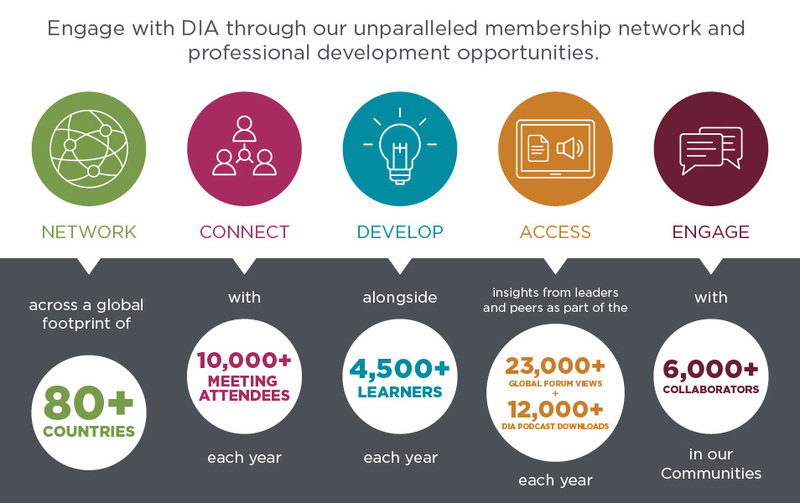 Today, professionals from 80 countries continue to engage with DIA through our unparalleled membership network, educational offerings, and professional development opportunities.